Small, bright pink, single flowers in March and April. Fairly vigorous, upright growth making a compact and bushy plant, good for a container. 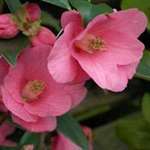 Cornish Spring is a hybrid of Camellia cuspidata, and the leaves are a lighter green and not as glossy as those of typical japonicas. The new growth is bronze coloured. Yet again I have had superb service from Trehane's. The plants which came very promptly were perfectly packed and in excellent condition. This plant was to replace an old specimen which had succumbed to over-enthusiastic strimming! I am delighted to have it - many thanks. This was the first time I'd ordered a plant online and I must say I was impressed by the whole experience provided by Trehane. I'd now order online again with them without hesitation. Order confirmation was speedy, delivery communication was efficient (and delivery arrangements flexible), and the plant was perfect. Top marks. Well grown plant, felt it was value for money.